After the most incredible weekend, I’ve had to come back to reality and play catch up. Coachella definitely lived up to the hype, exceeded all my expectations, and I can finally cross it off of my bucket list! The feeling of walking into the festival and spotting the iconic ferris wheel amongst rows and rows of palm trees, crowds of people decked out in their most festive-bohemian-hippie attire, and the sound of music from the different tents was pure bliss. Biting into the cold freshly cut juicy watermelon was the perfect way in helping us survive the desert heat. 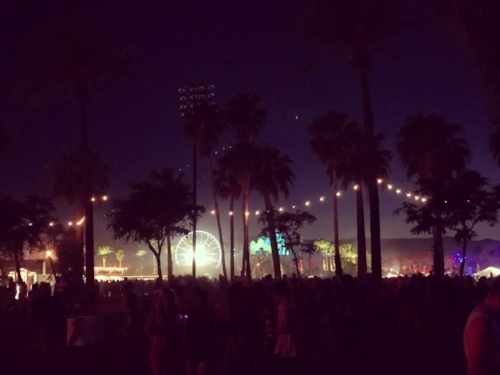 Coachella by night was a completely different scenario. As the sun would set, all of the colored lights lit up. The ferris wheel, palm trees, and art structures all assembled together amidst the beautiful desert sky. There would be a light breeze, as the temperature would begin to cool down. My favorite part would be towards the end of the night, when exhaustion was at its peak, and we’d all just lay down with our eyes shut, listening to the different performers. On to my looks from this weekend! I recently went on a short business trip to Birmingham, Alabama and came across a few super cute boutiques at The Summit. That’s where I discovered, fell in love with, and found all my outfits for the festival from American Threads and Lily Rain. I wanted to keep this look pretty simple because Travis Scott was that evening and I heard plenty of horror stories about what to expect from the crowd during his performance. I finally understood why the #isurvivedtherodeo hashtag was trending from his last tour. To be honest #iALMOSTsurvivedtravisscott. I channeled my inner ’70s vibe with this two-piece look. To be honest by day 3 I just wanted to throw on an oversized tee with leggings.. But I managed to stick to this short dress with booties. My top five favorite performances from this weekend were Travis Scott, Kendrick Lammar, Hans Zimmer, Lorde, and Jack Garratt! Side note: the food was awesome. I literally got the ooey gooey fries from Chego ALL 3 days. Can’t wait to hopefully go back next year!